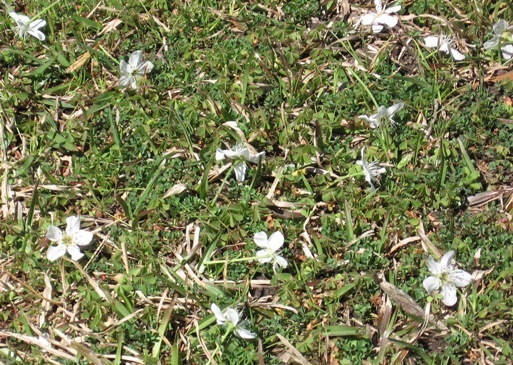 When I went out the door this morning there were tiny white flowers scattered everywhere. Could this be fairy snow? Did fairies scatter them all around? Then I looked up and around. We have two trees covered with white flowers. 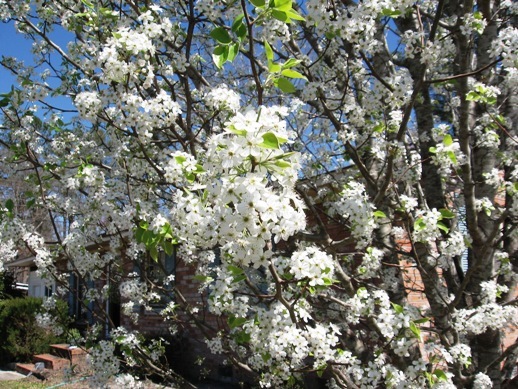 They are ornamental pear trees. Here are some flowers up close on the tree. My family likes to hunt mushrooms after it rains in the spring. We can do that in Indiana if we know which kinds of musrooms are safe to eat and which are not. Most are not, so don’t try hunting mushrooms to eat if you have to guess. You will die if you eat the wrong ones. We hunted for mushrooms in the woods in back of the field behind the barn. I really like the woods in the spring. The mayapples grow like bunches little umbrellas. If you are lucky you might see a Jack-in-the-pulpit growing out of the ground. The air smells so fresh and clean, and the ground was still damp from the rain. You have to look really close to find the good kind of mushrooms. They are brown and seem to hide in the brown leaves and dirt that is around them. While I was studying the ground looking for mushrooms I came upon a large tree stump that was rotten inside. Part of the stump was hollow, but not all of it. I squatted down to get a closer look. The inside of the stump looked like it had a floor made of green moss. Parts of the sides were green with moss too. Some tiny ferns and mushrooms were growing inside. It seemed to be a perfect house for little fairies to live in. I always wanted to see a fairy, but there weren’t any there. I loved my fairy house and looked at it for a long time when I discovered the rest of my family had moved farther into the woods. I couldn’t see them anywhere. I started to look for them and came to a place where the water was standing everywhere. I tried to go around it without getting my shoes wet, but I was getting scared too. I shouted and listened for an answer but didn’t hear one. Every way I looked there was water. Finally I tiptoed through the water to the other side. I began running and calling until I finally found my family again. I was so glad to see them. I wish I could go back and find my fairy house again, but how could I ever find it in the big woods? I guess I’ll just have to find another one.